Making your own wedding veil with a tiara and tulle can be simple, even without sewing. Before beginning your project, look through bridal magazines and find an "inspiration piece." This will help you focus your artistic efforts and ensure that the product is truly worthy of your special day. Pick a tiara that will most appropriately fit your bridal hairstyle. Hold one edge of the tulle by the width (1-yard side). Make a half-inch fold along the edge and either sew a hem with a simple stitch on your sewing machine or apply 5 to 6 dabs of hot glue along the fabric's edge to create a hem. Once the glue is cool and dry, apply a dab of hot glue on the two inside corners of the tiara. Attach the edges of the hemmed tulle to these points. Apply a dab of glue at the apex of the tiara (center of the tiara's inside curve) and attach the middlemost point of tulle there. Apply a dab of glue between the middle and the left end and attach the tulle to the tiara. Apply a dab of glue between the middle and the right end and attach the tulle. Repeat this process until you have adhered the hemmed edge of the tulle to the tiara, forming the appearance of many folds. Using the scissors, trim the bottom of the veil to the desired length. Slightly soften the edges of the veil by rounding them, or cut off the straight edge completely to form a curve. Using a hot glue gun, sewing machine or needle and thread, apply your chosen embellishments to the edges of the tulle or throughout the tulle. If you plan to wear an up-do and want the tulle to hang below your hair, place the tiara by itself above the up-do, and use your hot-glue gun to attach tulle to a clip to wear underneath the up-do. 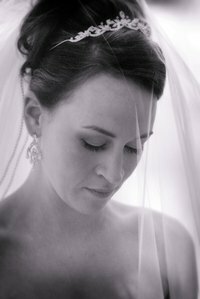 If your tiara is narrow, or you do not want your veil fabric to be 1 yard wide, cut the width of the veil to your liking. Veil fabric is traditionally between 18 inches and 1 yard in width. Consider applying small beads, rhinestones or sequins throughout the veil, spaced 5 or more square inches apart. Apply lace or ribbon along the edges of the veil. When using glue to apply your embellishments, apply the same embellishment on the other side so that glue does not show through the tulle.